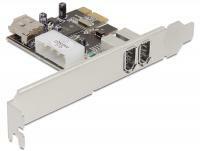 The Delock PCI Express Card powered by IOI expands your PC by three external FireWire 800 ports. You can connect devices like e.g. external enclosure, digital cameras, camcorder, adapter, etc. to the card. 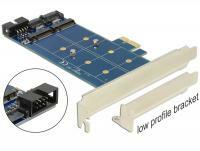 Easily extend your half size Mini PCI Express or mSATA card to full size by attaching it to this Delock extension. 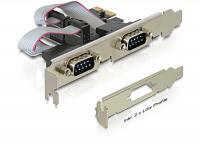 The Delock PCI Express card expands your PC by two external FireWire A ports as well as one internal FireWire A port. You can connect devices like e.g. 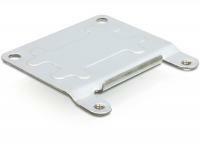 external enclosure, digital cameras, camcorder, adapter etc. to the card. 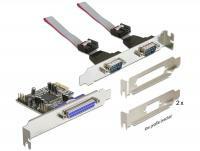 The Delock PCI Express card expands your PC by two external parallel ports. You can connect devices like scanner, printer etc. to the card. 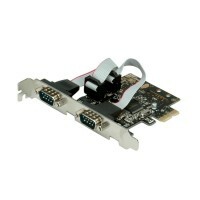 The Delock PCI Express card expands your PC by two external serial, also one external parallel ports. You can connect devices like scanner, printer, mouse etc. to the card. 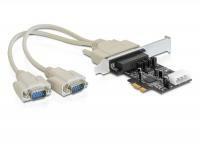 The Delock PCI Express card expands your PC by two external FireWire 800 ports as well as one external FireWire 400 port. You can connect devices like e.g. 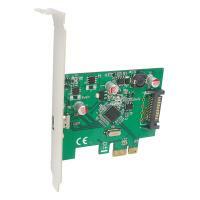 external enclosure, digital cameras, camcorder, adapter etc. to the card. 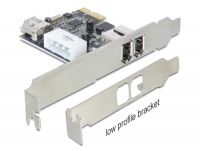 The Delock PCI Express card enables you a network connection with a data transfer rate up to 1000 Mb/s. 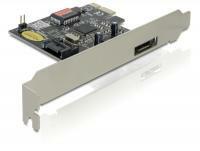 The Delock PCI Express card powered by IOI expands your PC by four external FireWire 400 ports. You can connect devices like e.g. 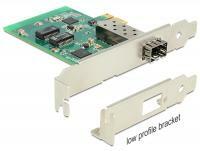 external enclosure, digital cameras, camcorder, adapter etc. to the card. 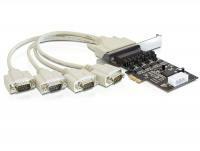 The Delock PCI Express card powered by IOI expands your PC by four external FireWire 800 ports. You can connect devices like e.g. external enclosure, digital cameras, camcorder, adapter, etc. to the card. 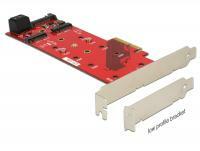 The Delock PCI Express card expands your PC by one external parallel port. You can connect devices like scanner, printer etc. to the card. 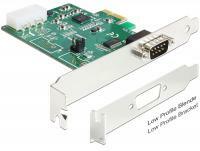 The Delock PCI Express card expands your PC by one external serial port. You can connect devices like scanner, printer, mouse etc. to the card. 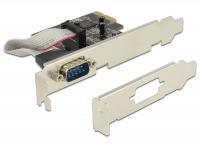 The Delock PCI Express card expands your PC by two internal USB 3.0 ports. 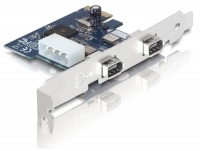 You can connect USB devices like e.g. 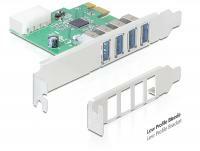 docking station, card reader, external enclosure etc. to the card. 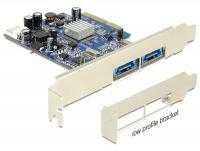 The Delock PCI Express card expands your PC by two USB 3.0 ports. 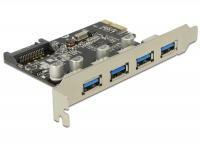 You can connect USB 3.0 devices internally and externally like e.g. 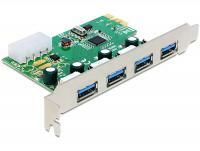 docking station, card reader, hub, external enclosure etc. to the card. 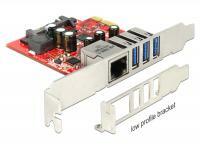 The Delock PCI Express card expands your PC by three external USB 3.0 ports as well as one internal USB 3.0 port. 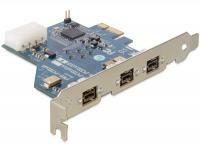 You can connect USB devices like e.g. 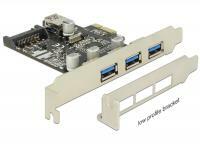 docking station, card reader, external enclosure etc. to the card. 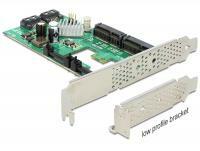 The Delock PCI Express card expands your PC by two internal SATA ports, as well as one internal IDE port. You can connect devices like e.g. 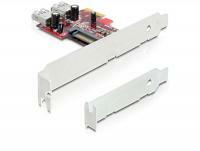 hard drives, DVD-drives etc. to the card. 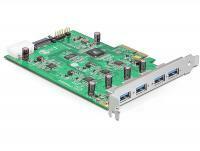 The Delock PCI Express card expands your PC by four external USB 3.0 ports. 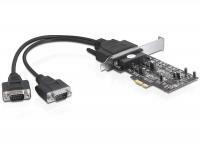 You can connect USB devices like e.g. 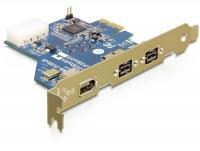 docking station, card reader, external enclosure etc. to the card. 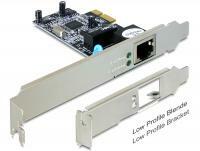 The PCI Express card by Delock expands your PC by one SATA 6 Gb/s port and one mSATA port. 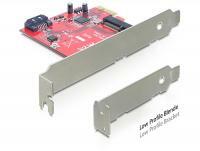 The card offers a hyperduo function. 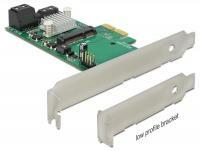 With this function you can combine a mSATA module and a HDD to use the advantages of both data mediums. The speed of a SSD and the capacity of a HDD. 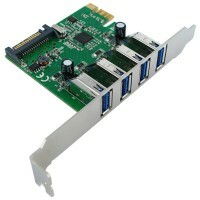 The card also supports the common NON-RAID, RAID0 and RAID1 functions. 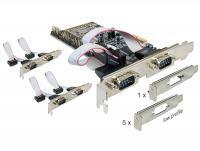 The Delock PCI Express card expands your PC by four external serial ports. 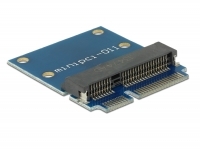 The serial ports support a voltage of 5 V and 12 V, which can be set through the jumper. 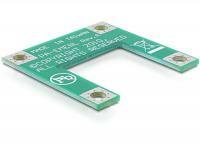 Thus you do not require an additional power supply for the connected devices. 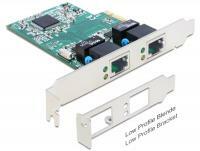 The Delock PCI Express card expands your PC by two external serial RS-422/485 ports. 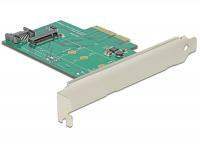 Use this PCI Express card for data logging or machine control systems. By using the jumper you can set e.g. 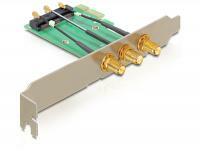 2- or 4-wire operation. 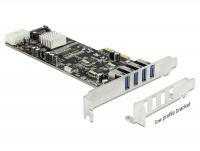 The Delock PCI Express card expands your PC by four external USB 3.0-A ports. 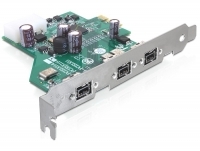 You can connect USB devices like e.g. 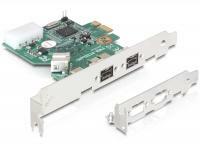 docking station, card reader, hub, external enclosure etc. to the card. 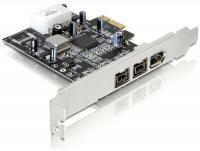 The card stands out due to the four USB Host Controller which can use one lane of the PCIe bus with 5 Gb/s. 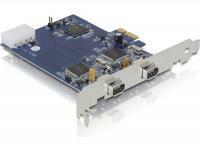 The Delock PCI Express card expands your system by eight High Speed RS-232 ports. 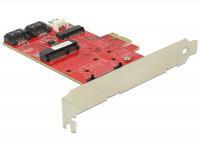 Use this card for applications like data logging, machine control systems, automation, development or communication. 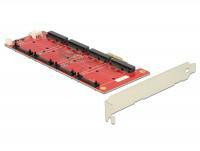 By the extensive surge protection and the wide temperature range this card can be used in the industrial area. 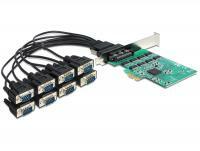 The Delock PCI Express card expands your PC by six external serial ports. You can connect devices like scanner, printer, mouse etc. to the card. 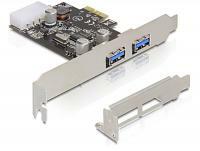 The Delock PCI Express card expands your PC by two external USB 3.0 ports and two internal SATA ports. You can connect devices like e.g. 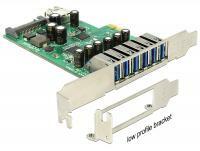 docking station, card reader, hard drives, DVD-drives etc. to the card. 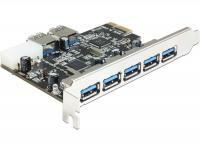 The Delock PCI Express card expands your PC by four external USB 3.0 ports. 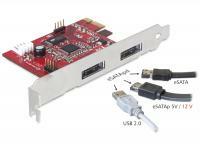 You can connect USB devices like e.g. 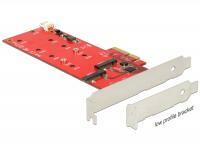 docking station, card reader, external enclosure etc. to the card. 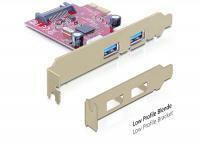 Due to the vertical direction of the USB 3.0 ports you can also install the card into a low profile slot. 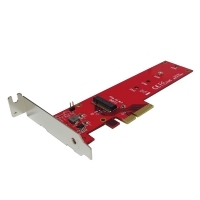 This Delock PCI Express network card provides a connection for an SFP module with a transfer rate of 1000 Mb/s. 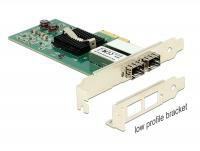 The SFP slot accepts an optional Gigabit SFP module from Delock to connect a PC via a fiber optic cable to the network. 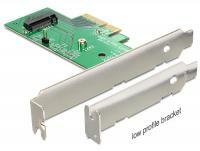 The PCI Express card by Delock expands your PC by one M.2 NGFF slot. 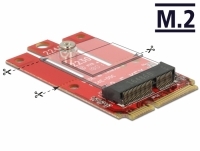 You can connect one M.2 NGFF SSD in format 2280, 2260 and 2242. 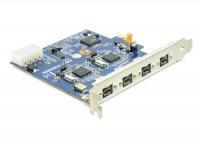 The PCI Express card by Delock expands your PC by three SATA 6 Gb/s ports and one mSATA port. 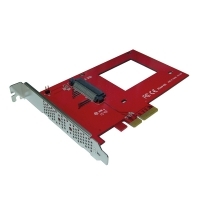 The card offers a hyperduo function. 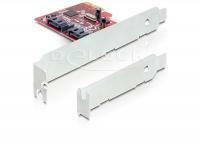 With this function you can combine a mSATA module and a HDD to use the advantages of both data mediums. The speed of a SSD and the capacity of a HDD. 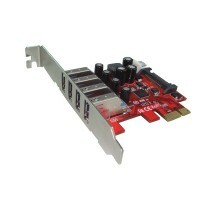 The card also supports the common RAID 0 and RAID 1 levels. 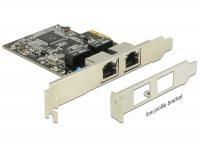 The PCI Express card by Delock expands your PC by two SATA 6 Gb/s ports and two mSATA ports. 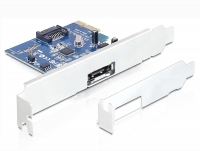 The card offers a hyperduo function. 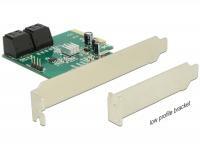 With this function you can combine a mSATA module and a HDD to use the advantages of both data mediums. The speed of a SSD and the capacity of a HDD. The card also supports the common RAID 0 and RAID 1 levels. 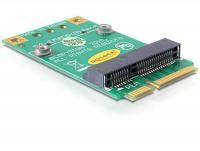 This PCI Express Card by Delock enables you to install up to four mSATA modules e.g. 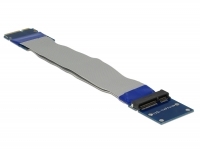 SSD. 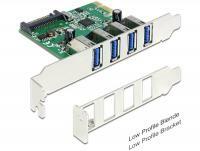 When using more than one SSD, you have the possibility to use different RAID level. 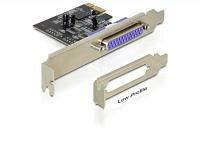 The PCI Express card by Delock expands your PC by two M.2 NGFF slots. 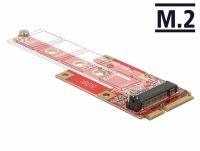 You can connect up to two M.2 NGFF modules in format 22110, 2280, 2260, 2242 and 2230. 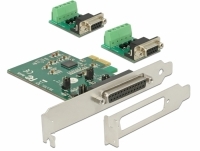 Whether you connect a module based on SATA or based on USB you have to connect the SATA connector or the USB connector with your mainboard. 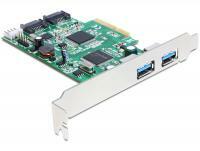 The Delock PCI Express card expands your PC by six external USB 3.0 ports as well as one internal USB 3.0 port. 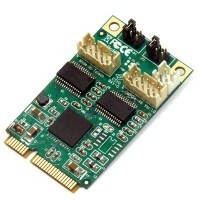 You can connect USB devices like e.g. 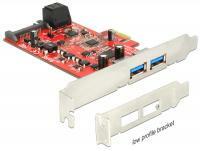 docking station, card reader, external enclosure etc. to the card. 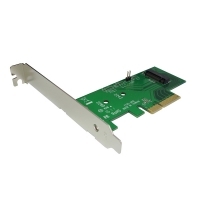 The Delock PCI Express card offers you a network port with a data transfer rate up to 10 Gb/s with conventional Cat.6 or Cat.6A copper cables. 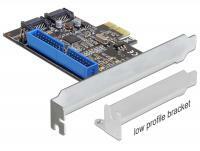 This PCI Express card by Delock expands your PC by one M.2 NGFF slot. 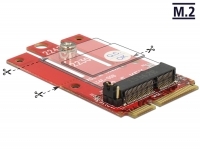 You can connect one M.2 NGFF SSD in format 2280, 2260 2242 or 2230. 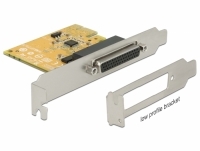 If you connect a SATA module you have to connect the SATA 7 pin port with your mainboard. 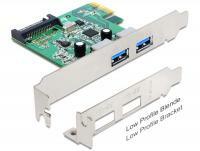 The Delock PCI Express card expands your PC by three USB 3.0 ports as well as one Gigabit LAN port. 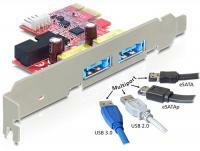 You can connect USB devices like e.g. 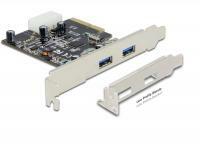 docking station, card reader, external enclosure etc. to the card. 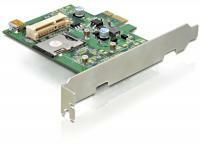 The card offers an additional network port with a data transfer rate up to 1000 Mb/s. 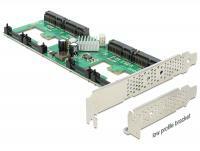 The Delock PCI Express card expands your PC by ten internal SATA ports. You can connect devices like e.g. 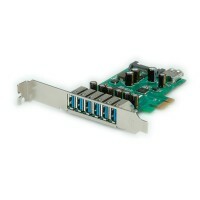 hard drives, DVD-drives etc. to the card. 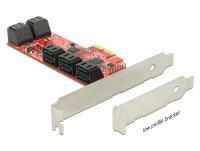 This PCI Express card by Delock expands your PC by two M.2 NGFF slots. 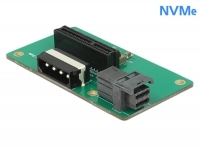 You can connect two M.2 NGFF modules in format 22110, 2280, 2260, 2242 or 2230. 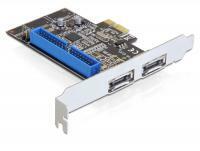 The Delock PCI Express card expands your PC by two external USB 3.0 ports. 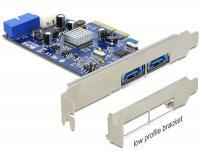 You can connect USB 3.0 devices like e.g. 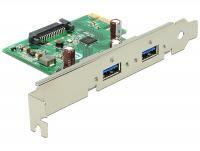 docking station, card reader, external enclosure etc. to the card. 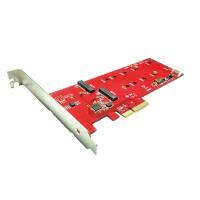 This PCI Express card by Delock expands your PC by three M.2 NGFF slots. 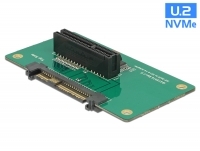 You can connect two M.2 NGFF SATA modules in format 22110, 2280, 2260, 2242 or 2230 and one M.2 NGFF PCIe module in format 22110, 2280, 2260, 2242 or 2230. 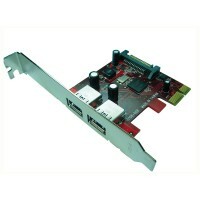 This PCI Express card x 1 expands a system to 4 mini PCI Express slots.The card based to the PCIe 2.0 specification and is backward compatible with 1.1 and 1.0a. 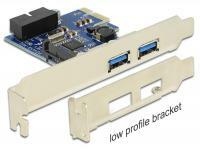 The Delock PCI Express card expands your PC by two external USB 3.1 ports. 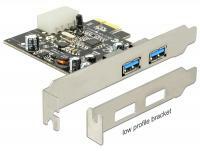 You can connect USB devices like e.g. 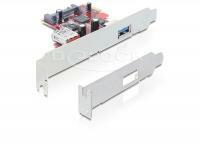 docking station, card reader, external enclosure etc. to the card.